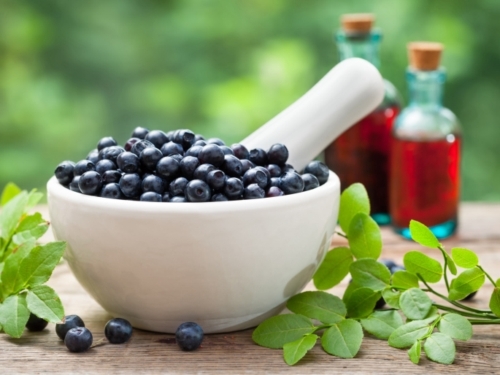 In a new report published in the Journal of Agricultural and Food Chemistry, researchers found that extracts from the wild lowbush blueberry (Vaccinium angustifolium Ait) can assist in the prevention of dental plaque formation. The findings may lead to a new periodontitis therapy that could also decrease the need for antibiotics. Gum disease, or periodontal disease, occurs when plaque builds up on the teeth, causing the gums to become inflamed and swollen. When left untreated, gingivitis can progress to a severe form of gum disease called periodontitis. For the study, Daniel Grenier and other researchers from Laval University explored natural antibacterial compounds in the treatment of gum disease. Research already suggests that blueberry polyphenols work against foodborne pathogens. The team wanted to see if wild lowbush blueberry polyphenols could also help fight a key bacteria species linked with periodontitis called Fusobacterium nucleatum. Researchers investigated the ability of wild lowbush blueberry extracts to fight Fusobacterium nucleatum and discovered that the extracts effectively hindered the bacteria’s ability to form biofilms. The extracts also blocked a molecular pathway in inflammation—a key component in gum disease. Currently, researchers are developing an oral device that will gradually release the blueberry extract after deep cleaning during the periodontitis treatment. Evidence also supports other natural gum disease treatments, including the antioxidants vitamin A, vitamin C, vitamin E, selenium, zinc, and coenzyme Q10 (CoQ10). Gotu kola and bloodroot are also herbal remedies that help inhibit plaque formation. Lagha, A.B., et al., “Wild Blueberry (Vaccinium angustifolium Ait.) Polyphenols Target Fusobacterium nucleatum and the Host Inflammatory Response: Potential Innovative Molecules for Treating Periodontal Disease,” Journal of Agricultural and Food Chemistry 2015; 63(31): 6,999–7,008, doi: 10.1021/acs.jafc.5b01525. “Blueberry extract could help fight gum disease and reduce antibiotic use,” ScienceDaily web site, September 2, 2015; http://www.sciencedaily.com/releases/2015/09/150902102651.htm. Murray, M., et al., The Encyclopedia of Natural Medicine (New York: Atria Paperback, 2012), 389–391, 883–889.